With Dublin Tradfest heading into town in the coming week, the chance to explore folk scenes from outside our own borders is one that looms large. Newfoundland is an unlikely hotbed, and one of their hottest properties, The Once, are one of the acts from outside our own shores that will be dropping into Dublin. Those Newfoundland origins are at the forefront of the band’s very existence, too. 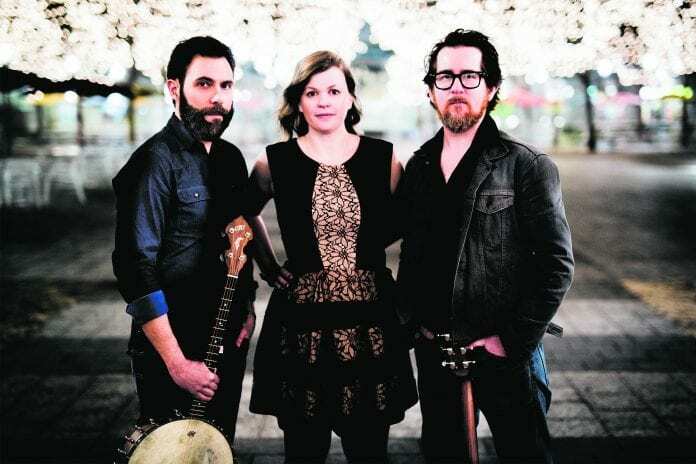 “Most of the people that came before us are immigrants that came from France or Ireland to Newfoundland,” Geraldine Hollett, one of the band’s vocal trio, explains. Their connections, especially on their most recent album, Time Enough, come not just from the music, but from a haunting, minimalist approach to lyrics. “It’s a conscious choice, especially for this album,” Hollett says of the toned-down approach. “Mostly they were written for anyone who has experienced love, loss, anxiety, low self-worth and apathy. So, everyone. “It was difficult, yes. Stripping things bare leaves us so exposed. We aren’t that comfortable running around naked these days! But we know how important it is to be real. “You do really question if it’s good enough. You have to trust that if it comes from a real and honest place, it will reach those it was intended for and not be hurt by the ones it wasn’t. “The older we get the deeper we delve and the more comfortable we get with it,” she continues. The long-standing vocal mix between the trio has become a real signature, though, one that stands tall on Time Enough, and helps their songs to soar. “It’s the crux of what we do,” Hollett says of the band’s complex and uplifting harmonies. “We don’t think about harmonies while we write. When we come to the table with our new songs, we do everything in our power to maintain it and we will change the song as much as needed to make it work. “We manage to keep everything we want to resonate intact. We like to think we hold back sometimes to intensify the harmony at the proper moments, so we don’t bore the pants off our audience. We love choosing our moments. “Heading outside our Canadian borders, where we know we make sense as a band – and trying our new material in Ireland, England and Europe where we have only visited a handful of times – is pretty exciting and nerve-wracking. “It’s important as artists to jump straight out of our comfort zones and into the arms of something unknown. It keeps us on our toes,” she said. The Once play the Pepper Canister Church, Dublin, on January 25.